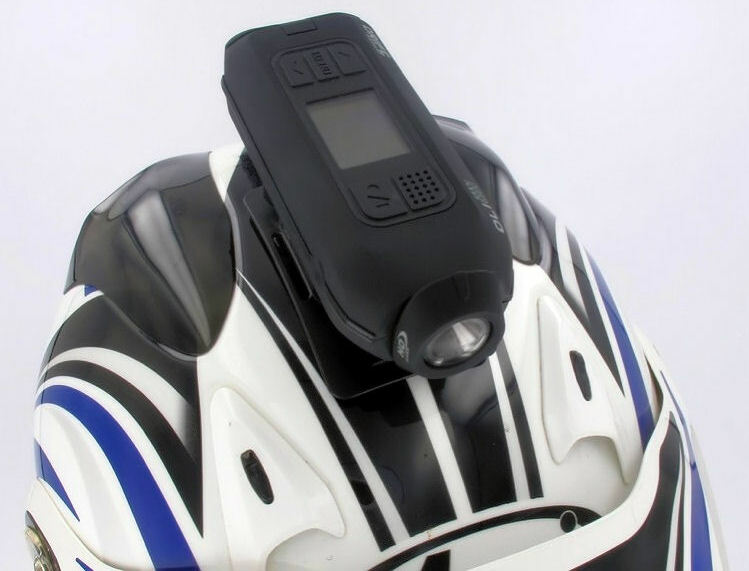 The Drift HD170 helmet cam is the best motorcycle helmet camera when balancing cost, quality, and features. I've been looking at, and reviewing, a bunch of motorcycle helmet cameras so I can get some high quality footage from my bike. I wanted a motorcycle helmet camera that was light, good quality, has a remote microphone input, and a variety of mounting options. My pick of the bunch is the Drift Innovation HD170 Stealth wireless HD helmet cam. I ended up taking delivery of the newly released Drift HD camera. If you think I was disappointed with it at first, imagine my annoyance when I watched a video created using the new GoPro Hero 2 HD camera with out-of-the-box settings. Drift should be embarrassed for releasing this camera to the market. The old HD170 Stealth even has better picture quality. My advice is, if you are thinking about a sports camera for your helmet, surfboard or car, get a GoPro Hero 2. Drift, you're FIRED!! Anyway, back to my original article about the HD170 Stealth. There are a number of reasons for my choice. For starters, the unit is quite small and light, but packs in a lot of features - even a small LCD screen for video playback and settings icons. 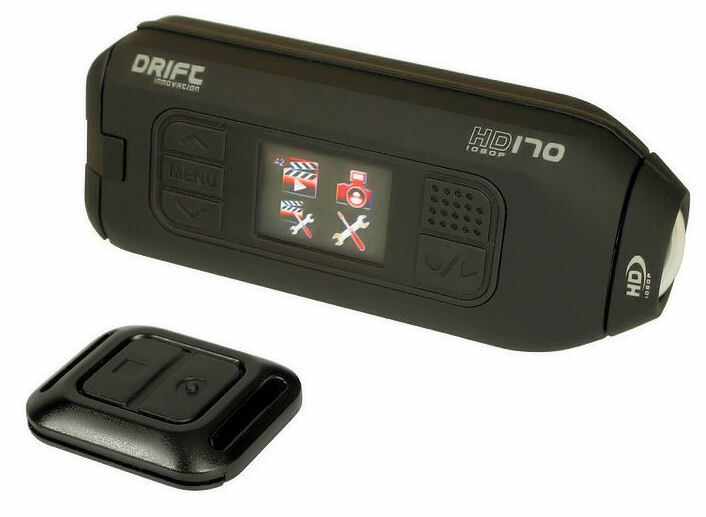 The Drift HD170 also has a wireless remote control with a large record and stop button which can be easily mounted to your handlebars, or by a band to your wrist. In a nutshell, the Drift Innovation HD170 is a full 1080p HD camera for creating crystal clear footage. It has a playback screen for lining up shots and the ability to play back the footage right on the spot. As previously mentioned, it also has a remote control to enable you to film what you want to record, and not the boring stuff in between. It has easy-to-use mounts so you can use it whenever you want and mount it anywhere your imagination allows you - so not JUST on your motorcycle helmet. The shape of the camera and the mounts it comes with make it the easiest camera on the market to use. The Drift also has a rotating lens so you can mount the camera at any angle and any position, a zoom function so you can get even closer to the action, an external microphone jack so no more listening to wind noise or having to overlay a music track to cover up the racket, and finally a night mode so you can record in darker and duskier conditions. But wait - there's more! Not only does if take video footage, it can take photos too - just put it in the photo burst mode and you can take pictures every few seconds for as long as your memory card lasts. Drift Innovation do what a lot of companies do these days and supply their full manual online - which is a good thing - you can get a much more detailed look at the video camera by downloading it before you buy. The above video was shot with a Drift HD170 Stealth HD Camera by Steve, riding along US Route 27 outside of Miami, Florida. His bike, a Harley-Davidson Street Glide with a 103 inch motor, Woods TW-555 cams, Jackpot Pro touring Mufflers, Fuel Moto 2-1-2 Headpipe, and a PowerVision Tuner, reaches about 110 MPH (177 KPH) in the video. Visit Steve's YouTube channel for more great live action videos. The Drift HD170 supports SD cards from all leading brands, but we recommend class 4 cards for video. The unit is also compatible with SDHC cards. It can support SD cards with a capacity of up to 32GB. The remote control uses radio frequency (RF) to communicate directly with the camera unit. 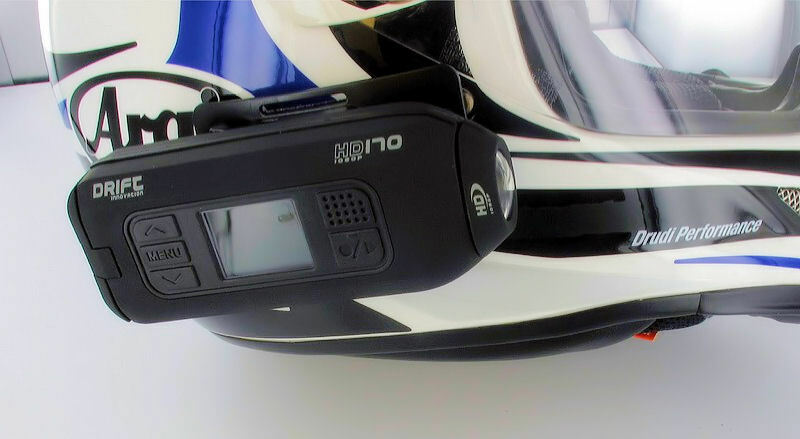 The remote is RF based, rather than infrared (IR), as used in other helmet cameras. As a result, you do not need to point the remote at the camera. As long as the remote is in range of the camera, it will pick up the remote control signal, and it has a range of 5 metres. The HD170 lithium battery is designed to be charged inside the camera. When a power source - a wall plug (not supplied) or USB cable - is connected to the back of the camera, the camera will immediately power up. While the camera is powered up the battery is not charging. The unit must be powered down by holding the select (on/off) button. The screen should power down, and LED on the select button should turn to blue. The camera will then be charging. The Drift HD170 has a specifically selected a 170° lens to provide users with the really quirky wide angle that was prominent in the early days of helmet cameras, particularly in skateboarding. The effect is less pronounced on objects in the distance and more pronounced on objects close to the camera lens. If you prefer a tighter angle, you can use the camera's zoom function, or shoot in 1080p. The camera is designed to be splash-proof, dust-proof, weatherproof, and dunk-proof but NOT designed to be underwater for sustained periods of time. For most users this level of waterproofing is more than adequate. For those users who would like to use the camera in water sports or for scuba/snorkelling, an aftermarket waterproof pouch available that may be suitable for the Drift range. The main camera unit and accessories costs $299.00, but I recommend the purchase of an external microphone (about $35), a 16 GIG SD card (about $55), and a silicone boot to prevent foreign particles from entering the camera when the remote mic is being used (about $29). So all up, ready to go, a touch over $400.00. If action footage from your motorcycle, car, BMX bike or whatever is what you want, I recommend the Drift Innovation HD170 Stealth. 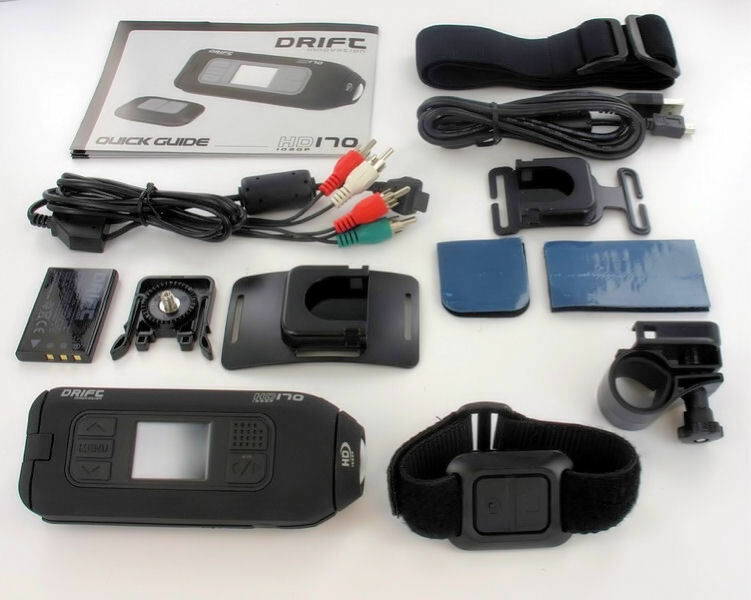 To purchase a Drift Innovation HD170 Stealth, I recommend http://www.sportscamera.com.au - visit their website or call them on (02) 4574 2797.